current exhibition are executed in black graphite on large-scale raw white canvases. They express the unique, personal and impressive language that the artist has developed during the past two decades – a language that is abstract, yet at the same time firmly constructed and meticulously designed. At first glance, the works in the exhibition look spontaneous but they are, in fact, the product of precise, careful planning and Sisyphean labor with thick graphite lines. It is interesting to trace the process by which they are created. First, Sheinman created spontaneous and unmediated preparatory sketches in pencil on paper. Next, she photographed the sketches and printed them on slides, from which she built the desired image, sometimes through assembling the slides one on top of the other, either fully or partially overlapping each other. She then projected the chosen composition onto very large canvases in her spacious studio and sketched in the contour lines. In the final stage, she filled in the contour lines with dense graphite lines that all merged together as a black surface. During the work of filling in, the large pieces of canvas were rolled up and laid on the studio’s table, with only a small section left exposed to work on. The work of filling in was slow and laborious, and it was only at the end that the fabric was fully unrolled to reveal the complete artwork. From this standpoint, the artist’s work recalls that of printmakers, whose creations are wholly revealed only at the end of work process. In contrast to the works in graphite, the art Sheinman has created in recent years on large sheets of paper is indeed spontaneous. In the spirit of the automatic painting espoused by artists of the Automatism movement in Europe at the beginning of the 20th century, Sheinman allowed herself nearly absolute freedom. The works present frenzied, spontaneous and direct eruptions executed within a short time frame with direct, immediate motions on the paper that was hanging on the wall. The entire exhibition, as well as its name, was created under a musical inspiration. Sheinman has played the piano since childhood, and her creative work in the studio is always accompanied by listening to music, which both provides inspiration for the painting and dictates her working rhythm. At the outset of her work on the Litvak Gallery exhibition, Sheinman considered installing variations on a piano in the center of the exhibition space, but finally decided to forgo its concrete realization and to leave only the sounds that guided her as she created the current installation. The installation also includes rolls of Perspex that rise to a great height, recalling the gigantic totems made of raw, exposed eucalyptus wood that rose more than three meters high in Sheinman’s monumental exhibition “A Line of Tohu” (2009) at The Open Museum, Tefen Industrial Park, in northern Israel. 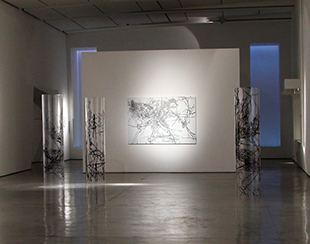 In the current exhibition, an assemblage of clear Perspex rolls was placed in the Gallery’s soaring and expansive exhibition space, with the images that appear on the walls stamped in black upon the rolls. Sheinman says that she wanted to extract the lines from the paintings and insert them into the space, thus allowing the viewers to walk around within them and experience them, just as they experience the sounds of the music being played in the space. As Gideon Ofrat wrote in his essay for the catalogue accompanying the exhibition at Tefen, “[…] Sheinman’s lines do not sustain ‘outlines’ just as they don’t sustain the string-lines of celestial chords.” Sheinman’s transition from color acrylic paintings to black-and-white paintings in graphite on canvas began in the 1990s, in her two solo exhibitions that I curated at the Haifa Museum. In the exhibition “Expulsion from Paradise” (1994), Sheinman presented variations on the fresco created by the renowned Renaissance artist Masaccio, who painted the expulsion from the Garden of Eden in the Brancacci Chapel in Florence in 1427. This was the last exhibition in which Sheinman displayed solely color paintings, but even in those works, it was possible to identify a thicket of lines drawn in black graphite within the composition. Three years later, in her Large-Scale installation “Venus Rising from the Sea” (1997), Sheinman presented dozens of variations of Venus. She placed her earlier large color painting of Venus at the center of the exhibition, which was created in homage to Sandro Botticelli’s best-known painting, “The Birth of Venus” (1482-1484). In Sheinman’s triptych, a life-sized Venus was depicted three times, each time against a different colorful background. To express an alienated reality, the figure was placed in a tangle of abstract elements made up of frenzied, prickly black lines. The triptych was installed on the inner wall of a tremendous open wooden box that grazed the ceiling – a sort of quasi-cupboard, quasi-altarpiece. The installation’s centerpiece – the massive cupboard – rested on the floor at the edge of a ten-meter wooden gangway, upon which Venus ascended from the sea, and then returned and descended to the viewer. Different variations of the Venus figure, drawn in black graphite on raw white canvas, appeared in the immense paintings that hung on the museum’s walls. Out of the wide array of major solo exhibitions over the years – both in Israel and internationally – in which Sheinman presented graphite paintings on raw white canvas, it is worth noting the huge two- or three-dimensional installations shown in the exhibition “Interior Space” at Bayerische Vereinsbank in Frankfurt (1996) and also at Sotheby’s in Tel Aviv (1998), in the exhibition “Meanings of Life” at the Ludwig Museum of Modern Art in Koblenz, Germany (1999) and in the exhibition “A Journey into the Depths of Dreams” at the Museum of Israeli Art in Ramat Gan, Israel (2002). The intuitiveness that reigns in Sheinman’s paintings creates the feeling that the intensity devours her life when it is spread over a diapason of subconscious emotions and experiences. Despite their expressiveness, the paintings are endowed with great intimacy and reflect a broad spectrum of human experiences. The artist takes upon herself the obligation to locate these emotions and give them expression in her work. When the accumulation of experiences bursts forth onto the canvas, it seems as though everything is happening there simultaneously, and the separation between past, present and future loses all meaning. The present, which is supposed to rule the moment, sometimes surrenders to the mighty forces of the past, and the future appears in the space of the painting as an unknown world containing a harbinger of hope. In the exhibition’s centerpiece, which occupies an entire wall ten meters long, Sheinman deals with the social and political changes that man foments in today’s world and describes the prevailing reality of chaos, for better or worse. The painting’s flickering lines relate to the storms and upheavals that rage upon human beings and leave them with a sense of uncertainty and at times, also helplessness. Sheinman’s monochromatic paintings are constructed from rhythmic, free lines set down on the raw white canvas. The tonal connection between one fragment and another creates equilibrium that balances between the forms and leads to a dialogue that weaves a rhythmic partita, endowing the works with a new look. The works maintain a fascinating dialogue between the vulnerable, exposed and tender interior and the cruel, fortified exterior. This dialogue reflects the arena of struggle between man and the environment, and the constant wrestling that shapes his relationship with himself, with other people and with the world surrounding him. Daniella Sheinman’s works do not focus on a particular period of her life but rather move between various occurrences from various times. Through the paintings, one can discern a philosophy of life transmitted from an individualistic perspective, and out of this worldview, the artist tries to put on the canvas, in each and every painting, life in its entirety and not in fragments. Thus, each painting seeks to give plastic expression to experiences of the soul that Sheinman accumulated over the course of her life. Sheinman’s riveting creation fundamentally carries dual meaning: on one hand, her abstract language and creative process radiate emotional and intellectual restraint, while on the other hand, the works arouse in the viewer tempests and emotions concealed in the flickering black lines on the raw canvases and transparent rolls like notes played on a keyboard from a musical score in black and white. These paintings are the artist’s musical partita, inviting the viewer to move through the exhibition within the harmony of black lines alongside the disharmony of contrasting forms. The exhibition is the field of action upon which the lines and forms play games of direction and movement. They jostle with each other, push and pull, show themselves able to accept and reject, and create between themselves harmonic or disharmonic relationships, dynamic hierarchies that shape ever-changing power relations.